A Natural Product for Reducing Sugar Levels in the Blood. "Glucodan" strengthens the action of the pancreas and stimulates it to produce insulin naturally. Insulin reduces the levels of sugar in the blood by helping the body to absorb it more efficiently. As a result, the body has a better ability to use that sugar to produce energy and build cells. Diabetes is known as one of the harshest and most common diseases in modern age. Diabetes has many negative effects on the several body systems. 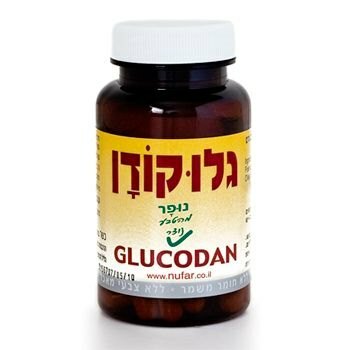 Glucodan naturally aids in reducing the levels of sugar, reviving the pancreas, and improving liver function. Glucodan contains the natural ingredients: Sarcopoterium spinosum (Spiny burnet), Trigonella Foenum-Graecum (Fenugreek), Olive leaves, Eucalyptus Globulus, Taraxacum officinale (Dendelion). This herbal formula is a unique in that it operates synergist Ely to reduce the blood sugar levels in a natural way. Spiny burnet stimulates the pancreas to naturally produce insulin that reduces the blood sugar levels. Dandelion rebuilds and rehabilitates the liver. It promotes renewed liver function and the purification of various wastes and poisons from the blood. Instructions for use: 1-2 capsules a day, after meals. For immediate treatment – 2 capsules a day. For preventing treatment – 1 capsule a day.